Partners in the CO-EVOLVE project, including the CPMR’S Intermediterranean Commission, recently handed over the last technical deliverable from the project’s studying phase. They are now fully ready to launch the testing activities, which will mainly focus on CO-EVOLVE’s pilot areas. 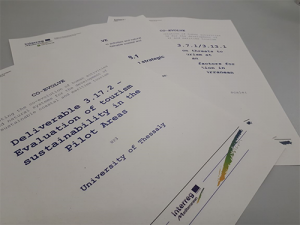 The publication on 8 February of CO-EVOLVE’s technical deliverable ‘Evaluation of Tourism Sustainability in Pilot Areas’ officially marked the end of the project’s studying phase. The first deliverables from the project’s studying phase to be produced were the analyses of the main threats (i.e. climate change, morphological stability, littoralisation, urbanisation, pollution, conflicts of use) and enabling factors (i.e. coastal and ecosystems protection, water cycle and depuration, transport and accessibility, legislation and governance) for the development of sustainable tourism. The project’s first set of deliverables, which was released in September 2017, also included pilot areas analyses and the ‘Tourism Sustainability Toolkit’. A second and final set of studying deliverables was recently published. It included the syntheses of threats and enabling factors analyses, the evaluation of the ‘Tourism Sustainability Toolkit’ itself and its application in pilot areas, and the ‘Tourism-driven Strategic Planning’. All these deliverables are available on CO-EVOLVE Deliverable Library. The CPMR’s Intermediterranean Commission (IMC), which leads the project’s communication activities, closely followed the development n of those deliverables, particular those special interest for its members (i.e. ‘water supply and depuration’; ‘transport and accessibility’; and ‘governance, legal, administrative and financial’ enabling factors analyses). Partners are now ready to engage in the testing phase, which will be running from February 2018 to May 2019. Further details concerning upcoming testing activities will be discussed at the project’s 4th steering committee in Bologna, on 6-7 March 2018. At this meeting the Emilia-Romagna Region, CO-EVOLVE’s testing phase coordinator, is organising a training course on 7 March to help partners be better prepared for the launch of testing activities. Finally, it should be noted that CO-EVOLVE was recently included as a key example for priority capitalisation, extension and replication at a wider Mediterranean scale in the Political Agenda for the promotion of Sustainable Tourism in the Mediterranean, recently approved by the CPMR IMC’s Political Bureau, which met in Cartagena on 15 February 2018.